I've avoided Apple. Apple products are the ultimate proprietary systems; hardware, OS and applications are exclusive of the Apple club in direct contrast to an open source direction I prefer. It was a Java based project requiring interface to a C-module via Java Native Interface, JNI, that forced me to buy an Intel-based iMac; I had no choice; the project demanded application development and testing not only on Intel-based but also on PowerPC based Macs. The minimalist design approach of Mac products grows on you. Even if the iMac does not work, it is a pleasure to look at it; from an ergonomics and mechanical design perspectives, it is an elegant, simple, functional unit. The aluminum-based keyboard is a good example of excellent ergonomics, minimalist inspiration, Apple-like design. But it was VMware's Fusion, the virtualization application for the iMac that made the iMac my choice Java and Internet developing station replacing a Vista based laptop. The combination of Fusion and Leopard's Spaces result in full-screen operating system instances available intuitively via control + arrow-keys. It all works well including instant sleep and restart, effective time synchronization, reliable network persistence, etc, instant on and off when needed quite a contrast to the experience with Vista + VMware's Workstation where 'sleep' and restart did not work or did not work well. Apple's Leopard operating as the host OS. I am unfamiliar with this OS. The console and Unix commands work well and was at home with its operation. Java 6 is not officially supported yet; it is in all guests I have installed. I do not use any of the Leopard tools such as iPhoto and iMovie. If editing pictures or movies I know I have the right environment and I'll try these tools later. MS Windows 2000 Pro as main desktop development environment. Java 6, GCC, NetBeans 6, JEdit and Ant are the tools that work well in possibly the best OS from Microsoft. I did not have licenses for Vista or XP but I did have an unused Windows 2000 license that operates as a simple, functional and most responsive MS OS uncluttered from the obstructive security alerts and other confetti added to XP and later to Vista that get in the way of productivity. Ubuntu 64-bit, 7.10, as main Server and development environment. This is the main server environment hosting Java 6, Apache, PHP, Tomcat, MySql, hsqldb, PostgreSql, etc. I could do this work on Leopard but I am familiar with Ubuntu and it works just as responsive and well, possibly better, under Fusion than in a dedicated environment. Solaris Express Developer Edition 64-bit for general development of the C-module and Java application on a Solaris platform. OpenSolaris is work in progress with the objective to make Solaris easier to use by adopting a Linux-like operation and presentation; it profiles as a good development and server platform. Each OS has 1-gigabyte RAM. They are all instantly available via control + arrow-keys as mapped by four Leopard Spaces running each OS in full-screen mode. Each OS has Subversion client installed to access a Subversion server hosted on a dedicated Ubuntu 64-bit environment on the Internet. In this manner, the Subversion server fills the data and version control functions and allows check-out and check-in for projects under work using any of the OSes listed above or a workstation at a client or project office. It nicely separates the tools, e.g. operating systems, from the data, e.g. projects and personal files. This approach allows me to use one or more environments as workstation development at home or project offices while relying on Subversion for data and project repository. Effectively each OS has only the data for the project under work data which is deleted once project is checked-in. All is not perfect however. It is mostly a matter of getting used to a new environment rather than functional problems. Ergonomics. 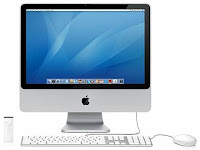 The iMac is an all-in-one desktop computer, simple, elegant, functional. VMware's Fusion. This virtualization tool possibly learned from VMware Workstation for MS Windows and had a fresh clean design and porting it to Leopard resulting in a great implementation hosting different OSes. 'Sleep' and restart works flawlessly including time synchronization with host at restart time. Matching screen resolution with host works well and contributes to the simple and effective transition among OSes via control + arrow-keys. Connectivity. Network settings and overall connectivity, wire and wireless, work well including network printing from guests to defined printer on host OS, Leopard. Keyboard. PC users will be searching for several keys unavailable on the minimalist wireless keyboard that came with the iMac. The delete key is effectively a backspace key, end, home, page-up and page-down keys are unavailable. There are key-combinations to simulate these; however it takes time to find them and more time getting used to using them productively. Also, some keys have one behaviour under the host OS, Leopard, and different one under Fusion guests. I am now used to these keyboard differences and I am able to operate productively; it is the cleanest looking keyboard; it is functional and I am able, after some time with it, to use it productively in all four operating systems. Mouse. The wireless mouse is the classical one button Mac mouse; I do miss the right-mouse click which is simulated by control + click. In summary, I will not have selected this environment should not have been for the project requirement to develop and test on an Apple platform. The discovery of Leopard + Fusion made the case for me to switch to this as my primary workstation where I can use any of the four top desktop operating systems as needed while all interacting with the same data and project repository under Subversion. The result is a proprietary system, iMac + Leopard + Fusion, used as the base platform to host Microsoft and open source OSes, and associated development tools, resulting in a productive, multi-OS self-contained workstation. I suspect I'll be looking at Apple's MacBook to replicate a mobile equivalent of the configuration described above. The rumored announcement by Apple, on January 15th, of an ultra portable MacBook may be the fully functional multi-OS compact laptop I'd like to use for presentations and for work while away from the office. N.B.1 MackBook, MacBook Pro and respective successors, hosting Ubuntu via Fusion, profile as compelling alternatives to anyone considering a MS Windows laptop, Win2k, XP or Vista, and/or a Linux mobile unit such as a Dell Ubuntu laptop. N.B.2 There are at least 3-products that provide virtualization on the Mac: Boot Camp, Parallels and Fusion. This reference offers a benchmark and comparison among these products.